Ms. Nopparat Aumpa has worked for Banyan Tree for 20 years joining the company at Banyan Tree Bangkok in a front office role. Gained experience around Asian hotels and returned to Banyan Tree Bangkok 4 years ago as General Manager . Grow the luxury market through excellent personalised service, innovative restaurants and bars with stunning views and Bangkok’s best spa experience. 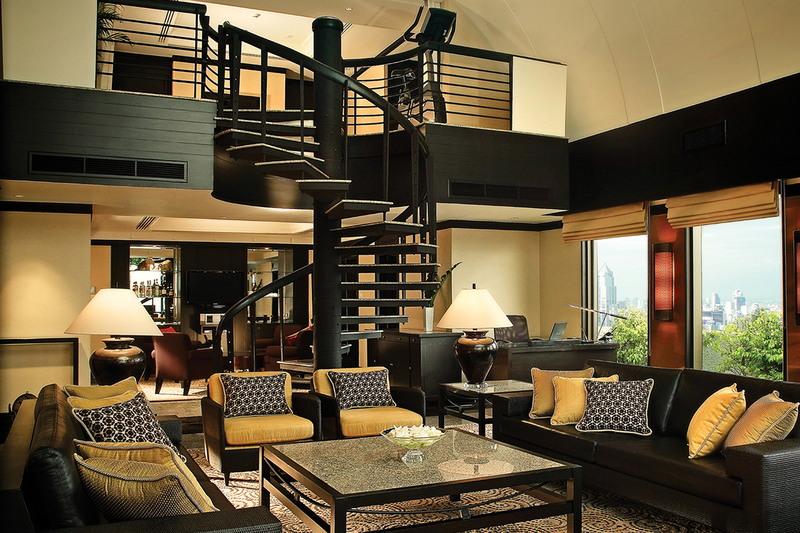 Banyan Tree Bangkok was the fourth property to be established by Banyan Tree Hotels & Resorts, in January 2002. Located in the central business and entertainment district of Silom/Sathon, the hotel is just 40 minutes away from Suvarnabhumi International Airport. The facilities within the hotel provide the ultimate convenience for guests; include a business centre, a fitness center, 12 meeting rooms and a swimming pool. 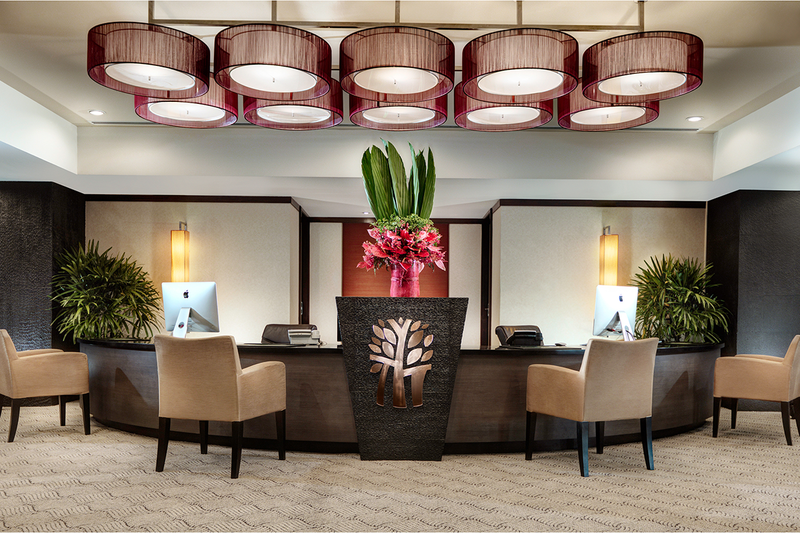 The award-winning Banyan Tree Spa and Banyan Tree Gallery can also be found at the property. 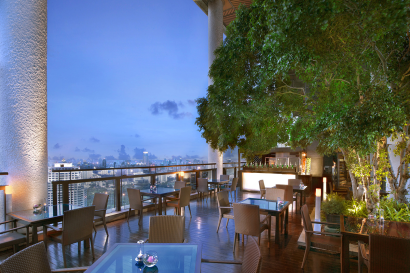 Probably most well known for the 61st floor al fresco roof top restaurant Vertigo. 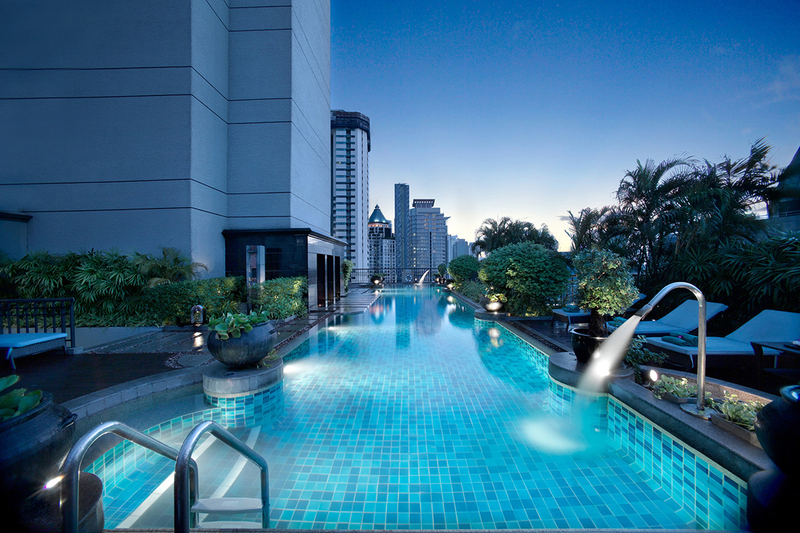 Only 5 star luxury all-suite hotel in Bangkok. Rooftop Vertigo and Moon Bar on 61st Floor. 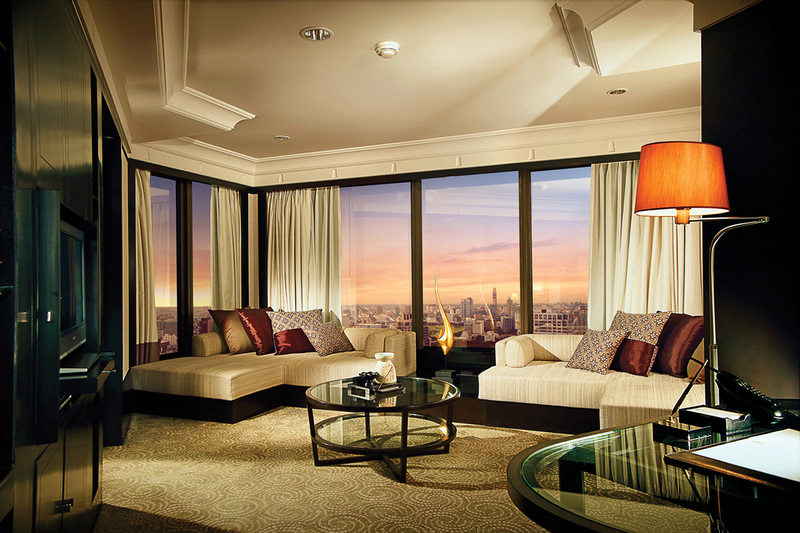 Rooms from 22 to 58th floor. Near business area of Bangkok and short walk from the bustling night markets of Silom and the BTS Skytrain station and only minutes also from the Lumpini MRT Station (underground). Only 10 minutes drive or 2 stops on skytrain from River. Banyan Tree Bangkok also offers guests great ease to access shopping and sightseeing, as it is strategically located near shopping centers and tourist landmarks. The hotel’s Shopping Companion Service gives guests the chance to shop with experts, who are just as familiar with weekend markets as they are with fashionable department stores. Other sites and activities in area include Walking in Lumpini Park, Night markets and Central Mall in Silom, 10 minutes to shopping centres of Central Embassy, Central World, Central Chitlom and Siam Paragon. 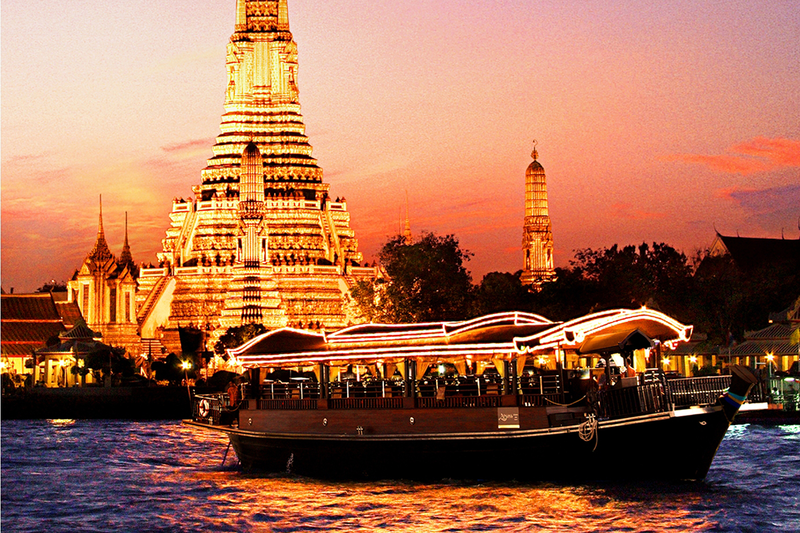 Sathorn Pier is only 3 stops by BTS Skytrain for easy access to river cruises. Short walk to MR Sukrit Heritage Home. One of Bangkok’s tallest hotels. 5 of the 6 restaurants are on the 52nd floor and above. 327 rooms but over 500 staff to look after our guests. Largest lead-in room types at 48 m2. For guests staying on the Club Level ( Serenity Club, One & two bedroom suites and Presidential suite) there is a kidzone adjacent to the Club Lounge. Unsupervised . Baby Sitting services are available (additional charge). 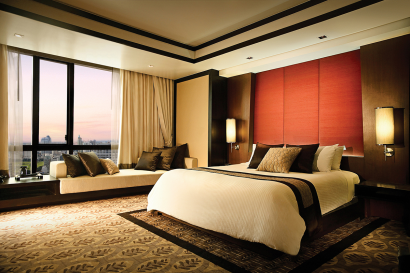 Number of rooms in all: 327 rooms, the largest luxury rooms in Bangkok starting at 48 m2. All of them are tastefully designed to showcase the essence of Thai heritage fused with modern amenities to pamper the senses. Each has a fragrant oil burner with daily changing aromas. All rooms also have a gen4erous living area with at least a 3-seater couch and armchair providing excellent living space. • Horizon Room 48 m2 – 141 rooms with separate lounge with 3 seater day bed and lounge chair. • Oasis Retreat 46 m2 – 50 rooms. 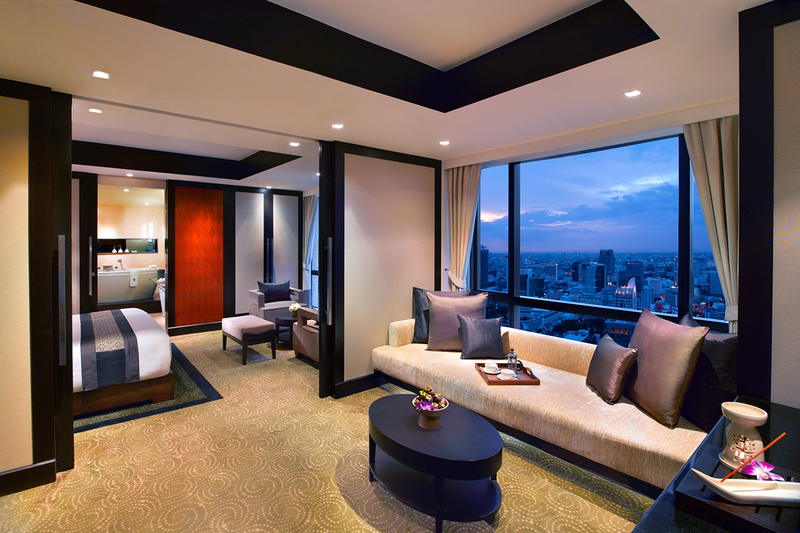 Junior suite-style with feature bathroom with free-standing bath in the window with panoramic views of Bangkok city. Rooms come with access to the Living Room –with a public space to relax in and enjoy espresso coffee, tea, soft drinks, juices and snacks from 7am to 7pm. • Serenity Club 48m – 48 rooms, On the top floors of the hotel 50th floor and above, renovated in 2015 with light earthy tones they have a large living area. 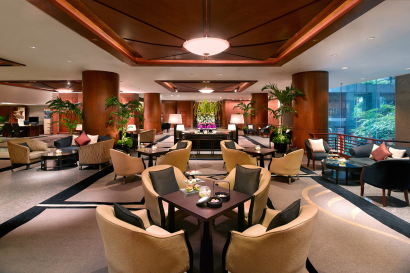 Access to the Club Lounge with full cooked breakfast, snacks during the day and full bar and canapés n evening. • Two-bedroom suite 120–140 m2 – 16 rooms. Perfect accommodation for families or two couples travelling together. Large master bedroom and a generous second bedroom and 2 ½ bathrooms. Large lounge and dining roo with kitchen. Lounge Access. • Spa Sanctuary Suite 118 m2 – 3 rooms. With one king bedroom , oversized lounge and your own private couples treatment room the suite comes with unlimited massage during your stay. Al fresco dining on the rooftop of the 61-storey Banyan Tree Bangkok with outstanding 360 panorama of the city. Enjoy a drink or dinner under the stars. Sublime bar expérience on the 60th floor and feasting your eyes to the stunning views of Bangkok and the Chao Phraya together with a cocktail from the award-winning Mixologist. Innovative tapas menu. A modern split level restaurant serving Japanese Cuisine. 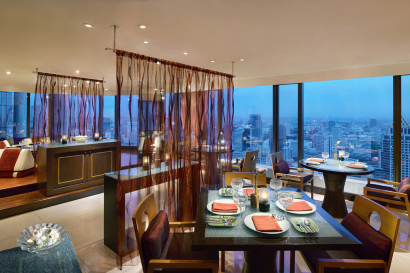 Signature restaurant of Banyan Tree hotels and resorts, serves traditional Thai dishes with a modern, creative twist. 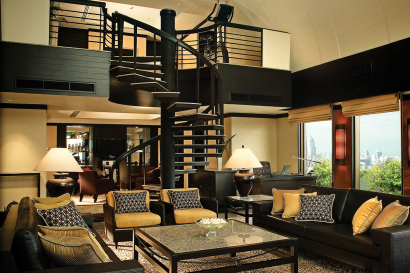 A sky deck on the 51st floor offering dinner and drinks with stunning views of Bangkok. 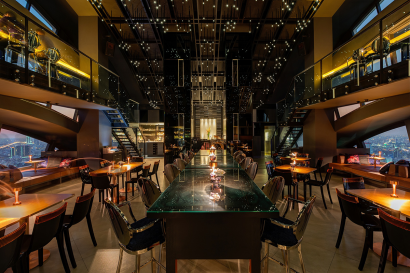 All day dining restaurant features an extensive range of breakfast, lunch and dinner. A full range of sandwiches, pizzas, salads, deli products, pastry & bakery items and ice creams. Enjoy dinner on the Chao Phraya river on board the noble teak wood vessel, indulge in selections of royal Thai cuisine and canapes. 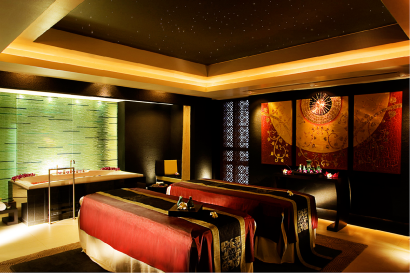 • Banyan Tree Spa with 16 treatment rooms. • Swimming pool – outdoor. Main facilities : basic AV equipment including one set of LCD Projector, White board flip chart and markers. Thai cooking class, Muay Thai Classes, Fruit carving Classes. • BRIDES magazine “Best Honeymoons Award” for the category of Top City Hotel under $350.